Elizabeth “Beezie” Madden of the USA won the first day of competition at the Longines FEI World Cup™ Jumping Final in Paris on Thursday. Widely considered the best female jumper in the world, Madden turned in a magnificent clear ride in 61.89 seconds aboard Breitling LS, besting a field of top international athletes all vying for the coveted championship title. Keeping her horse beautifully on her leg and driving continually forward, Madden was the first rider after the event’s interim break, and hers became the time to beat for everyone who followed. German Daniel Deusser, the 2014 winner in Lyon, came closest, with a 62.61-second ride on Cornet D’Amour enough to secure second place. Madden paid tribute to Breitling after clinching the first-round victory. Third place in Thursday’s speed class went to Devin Ryan, also of the United States, who gave good chase to Deusser and Madden, riding Eddie Blue to a clear round of 62.84 seconds. “My horse was amazing,” said Madden. “I thought he’d be quite good at this leg. We’re off to a good start. “I wanted to attack as much as I could, but not risk too much. It was close. Daniel Deusser was within a second. “I’m really happy with how I did it and hopefully my horse is good tomorrow. We don’t have to go fast now, we just have to try to jump clear." 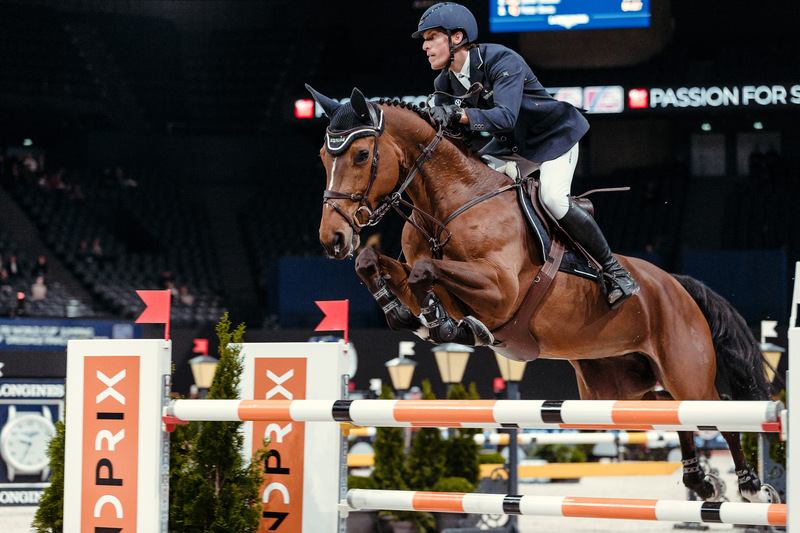 It has been 14 years since Paris hosted a Finals competition, and the crowd was eager to see both the four French athletes representing the home country and the other 33 riders who braved 16 qualifying legs around the globe to make it to the City of Light. The twisty course, designed by Spain’s Santiago Varela Ullastres, was deceptively tricky. With 13 obstacles and 16 efforts, it offered a few opportunities to shave strides and ground coverage to those courageous enough to take them. But with three days of riding to pace for, riders had to balance risk with experience and their partnership with the horse. The first obstacle proved a devil for many riders, who accrued four-second faults straight away in the competition. Those who were able to turn in clean rounds found extra seconds that boosted them in the final standings for Day 1. Germany’s Marcus Ehning, who has won the FEI World Cup title three times in the past, snagged fourth place. Coming in fifth was Henrik Von Eckermann of Sweden, who placed third in Omaha last year, and managed to execute a fast ride even with one rail down. The remaining top eight spots went to Pieter Devos of Belgium, Eduardo Alvarez Aznar of Spain, and Carlos Enrique Lopez Lizarazo of Columbia, respectively. Whilst the reigning champion Mclain Ward hoped to position himself for another victory, he found himself further down the field when a four-point penalty added to his time. One of the high points of the evening was seeing Great Britain’s Michael Whitaker in the arena again, as he competed in an astonishing 25th FEI World Cup Finals. His nephew, Robert, was also riding in the event, in what has now become a family tradition. Deusser said: “We had a very, very good course because nobody went really really fast. I think all the horses are jumping good still and have enough power for tomorrow." Although Day 1 of Jumping certainly set the tone for upcoming competition in this 40th year of the FEI World Cup, the podium is still wide open to the top riders, and anything can happen in Day 2’s Table A event or Sunday’s majestic Grand Prix. Stay tuned to FEI TV to see who will take the prestigious Longines FEI World Cup™ Jumping Final in what is shaping up to be one of the tightest competitions in history.